Finally, a calculus book you can pick up and actually read! 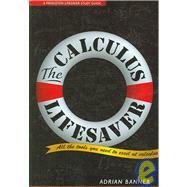 Developed especially for students who are motivated to earn an A but only score average grades on exams, The Calculus Lifesaver has all the essentials you need to master calculus. Companion to any single-variable calculus textbook, Forty-eight hours of accompanying video available at www.calclifesaver.com, More than 475 examples (ranging from easy to hard) provide step-by-step reasoning, Informal, entertaining, and not intimidating, Tried and tested by hundreds of students taking freshman calculus-proven to get results, Theorems and methods justified and connections made to actual practice, Difficult topics such as improper integrals and infinite series covered in detail, Emphasis on building problem-solving skills. Book jacket.